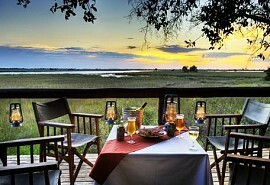 This premier 6-night safari visits the highlights of 3 private and exclusive wildlife areas within Botswana. Guests will experience a true wetland paradise in the heart of the Okavango, the beautiful Moremi Game Reserve and the vast landscapes of the Linyanti Wildlife Reserve. Activities will be accompanied by an expert guide and include game drives, guided bush walks, mokoro rides, boating, birding, fishing, and night drives. On arrival at Maun airport, guests will be met by a representative and assisted to their light air transfer to Jao Camp for 2 nights on a fully inclusive basis plus game activities. Xigera has permanent water all year round, hence the emphasis is on water activities. Jao Camp consists of 9 beautiful luxurious tents. These canvas and thatched rooms are situated underneath a canopy of shady trees, have ensuite facilities, and outdoor showers for the more adventurous guests. Game viewing in the area is good year-round and mokoro excursions, boat trips, fishing, guided nature walks, day and night game drives as well as birding opportunities are usually on offer for most of the year due to the abundance of wildlife in the area. After breakfast and morning activities, guests are transferred by light aircraft to Vumbura Plains Camp for 2 nights on a fully inclusive basis plus game activities. Activities focus on game drives as well as guided walks with night drives being a highlight. Vumbura Plains is situated in the far north of the Okavango Delta in a 60 000 ha private concession offering extraordinary wildlife viewing. Vumbura Camp consists of 2 separate 7-roomed satellite camps, each with its own elevated dining, lounge and bar area tucked beneath a canopy of cool, shady trees and spectacular views across the floodplains. Guests are transferred by light aircraft to Kings Pool Camp where they will stay for 2 nights on a fully inclusive basis plus game activities. 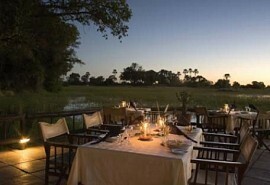 Activities focus on game drives, as well as guided walks, with night drives being a highlight. 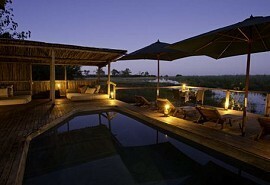 Kings Pool Camp is situated in the private Linyanti Wildlife Reserve, an enormous concession teeming with wildlife, overlooking the Kings Pool Lagoon on the western boundary of Chobe National Park. Kings Pool offers 9 luxurious canvas and thatch tents consisting of a large bedroom area, lounge, private plunge pool and 'sala'. After breakfast and morning activities, guests are transferred by light aircraft to Kasane airport in time for their onward travel arrangements. This premier safari visits the spectacular wildlife highlights of the Okavango Delta and the Savute Marsh in the Chobe National Park. 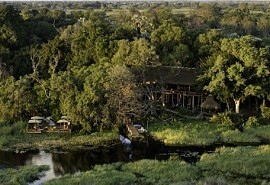 Guests will experience the tranquil waterways of the Delta as well as the legendary elephant capital of the world.